As I reflect back on these memories of ten years ago (Part 1 – The Meadow Party), I am using photos and notes to help me remember. When I started to think about the weekend that Scott proposed, I opened our wedding album. Included in the album is a timeline from the meadow party to our wedding day and some of the events that happened along the way. This part of the story was already included so I decided not to rewrite it. I will save you the math – there were 155 days from the Meadow Party to the day that Scott proposed and I would have said yes many days before this. Here are the words that I wrote in 2004 about that day. There is a show on The Learning Channel called A Proposal Story. The show helps men plan and execute elaborate proposals. 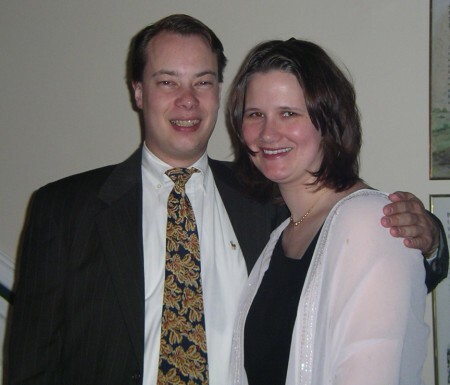 I have watched many episodes of romantic and creative proposals and I have never seen anything that compares to the perfect evening that Scott planned for us on Sunday, March 14, 2004. I was going to New York City for a tradeshow and decided it would be fun to take Scott with me. We arrived in New York on Saturday and went to the Big East Championship game that night. Sunday afternoon we went to Serendipity for lunch and wandered around shopping. Scott had asked me to bring a nice outfit for dinner on Sunday so I bought a black sleeveless dress with a pink beaded shawl prior to the trip. We got dressed up and ready and Scott asked me to wait for him in the hotel bar (Westin New York Times Square). When he came down to the bar we got into a cab and headed to a destination unknown to me. The cab left us at the entrance to Central Park where we boarded a horse-drawn carriage and rode through the park. Eventually the carriage stopped near a lake and Scott and I walked down to the water where he proposed. We didn’t stay by the water long because it was cold; we went back to the carriage and bundled up in blankets for the remainder of our ride. The carriage dropped us off at One Central Park West, the address of Trump World Towers. Scott had reservations for us at Jean Georges – a fabulous restaurant and dinner was very good. Once we were inside I had the opportunity to admire my engagement ring. The ring belonged to Scott’s Great-Grandmother Luella Leindecker. I love that it is a family heirloom which makes it even more special. After dinner we took a cab back to the hotel (we started to walk, but I was wearing pretty shoes, not walking shoes). At the hotel, I waited outside the room while Scott went in first. After a few minutes I walked into a hotel room which has been transformed. There were pink rose petals and pink candles everywhere and a bottle of champagne on ice. 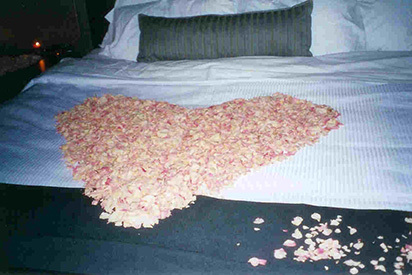 I later learned that Scott had the freeze-dried rose petals shipped ahead to the hotel from Flyboy Naturals a company in Oregon. He purchased the candles and brought them to New York. Scott also had some help with the final room set-up. 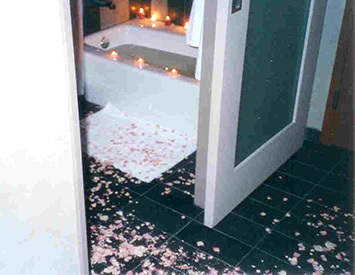 He made arrangements with the concierge to disperse the candles and rose petals throughout the room so Scott just needed to light the candles. The end result was a magical evening and true fairy tale proposal. WOW. WINNER WINNER CHICKEN DINNER. You two kids are so cute!!! Seems like yesterday… how was this ten years ago?